The OMB-DBK60 expansion module allows the OMB-LOGBOOK and OMB-DAQBOARD-2000 Series data acquisition systems to be expanded with any combination of up to three analog or three digital OMB-DBK signal conditioning and expansion cards. Removable termination panels offer the user a choice of connector types including BNC, removable screw terminal, thermocouple and safety jacks. Each panel includes pre-stripped wires by which the user can connect to any of the three OMB-DBK cards installed in the OMB-DBK60 enclosure. A user-customizable blank termination panel is also available for custom applications. 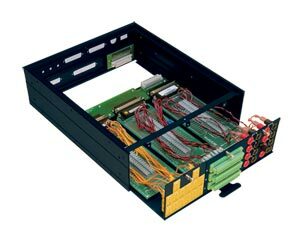 The OMB-DBK60’s three-card internal backplane eases cabling by bringing all connections out to a single DB37, thus only a single cable is required to attach an OMB-DBK60 to a system. Analog and digital DBK cards cannot be mixed within one OMB-DBK60 enclosure, and thus a separate enclosure is required for analog or digital cards. An unlimited number of OMB-DBK60 enclosures can be secured to one another or an OMB-LOGBOOK system. The OMB-DBK60’s metal enclosure features a slide-in drawer for easy access to the OMB-DBK cards. The OMB-DBK60 can be used as an expansion module for OMB-DAQBOARD-2000 Series systems. Each OMB-DBK60 will accept up to three analog expansion cards or three digital expansion cards. Analog and digital expansion cards cannot be mixed within one OMB-DBK60 enclosure. Eight different termination panels are available for use with the OMB-DBK60. These include the OMB-DBK602 BNC termination panel, OMB-DBK603 red safety-jack termination panel, OMB-DBK604 red and black safety-jack panel, OMB-DBK605 thermocouple input termination panel (specify thermocouple type), OMB-DBK606 removable-block screw terminal panel, OMB-DBK607 slotted termination panel with adjustable clamp and OMB-DBK608 termination panel with three DB37 connectors. To complement OMB-DBK cards installed in the OMB-DBK60 enclosure, users have a choice of eight termination panels that provide a variety of input connectors. The termination panels screwmount to the rear of the OMB-DBK60 chassis, and include the appropriate style wire to connect each input to an enclosed OMB-DBK60. You can stack the OMB-DBK60 beneath an OMB-LOGBOOK portable acquisition module. The result is a compact and securely connected data acquisition system that you can conveniently carry from one application site to another. Expansion cable from OMB-LOGBOOK to similar width module, 2.5 in. Expansion cable from OMB-LOGBOOK positioned more than one OMB-DBK60 height away from the appropriate P1 or P2 port, 11.5"
참고: *Insert thermocouple type B, J, K, R, S or T **Blank termination panels are included at no charge when no additional panels are ordered.